Extending from 5th Avenue to the East River between 26th and 40th Streets, Murray Hill is a quiet neighborhood full of residential buildings and restaurants. Its charming, tree-lined streets have long attracted those who want to live in Manhattan, without all the noise and bustle. 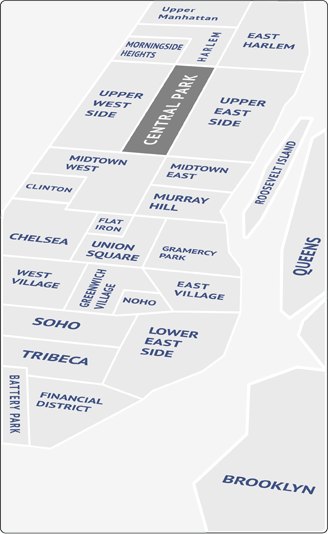 If you work in Midtown, Murray Hill, just minutes away, is an ideal place to live. It doesn’t have the glamorous reputation of SoHo or Tribeca, but people who move to Murray Hill tend to like it enough to stay there. The neighborhood is a mix of prewar buildings, townhouses and high-rises. The rents are about average for Manhattan. Murray Hill’s reputation as a restaurant desert has outlived the reality of the situation. In recent years, the opening of several hotspots, like Asia de Cuba and Blue Smoke, has created a situation once thought impossible: people traveling to Murray Hill for an evening’s entertainment. Shopping in Murray Hill is not the best on the island, but you aren’t more than a ten minute walk to better prospects. For necessities, 3rd Avenue and Kips Bay plaza, with its supermarket, Movie Theater and gym, can’t be beat. And while the area isn’t known for its artistic contribution to Manhattan, it does have one of the better small museums around: the Pierpont Morgan Library. At night, the Rodeo Bar, with live music and an always boisterous crowd, is Murray Hill’s biggest attraction. Aside from being a nice neighborhood for a Sunday stroll, Murray Hill is not an outdoorsy kind of neighborhood. The East River walkway is a pleasant stretch for a jog, and the architectural and historical attractions of the area can make for an interesting walking tour. As a younger and younger crowd moves in, expect Murray Hill to develop its commercial and entertainment muscle.